Spa-tastic Giveaway! 10 Tips to Manage Holiday Stress. Stress. We all have it. Some of us let it take us down like a ripped linebacker tackling a waify quarterback. And some of us are stress-masters, grabbing hold of stress and buckling it up tightly so that we control its every move in our bodies. And yes, stressed is desserts spelled backwards. So that means stress and a plate of holiday sugar cookies do not mix well together. Don't let stress scrooge-up your plans for holiday cheer. 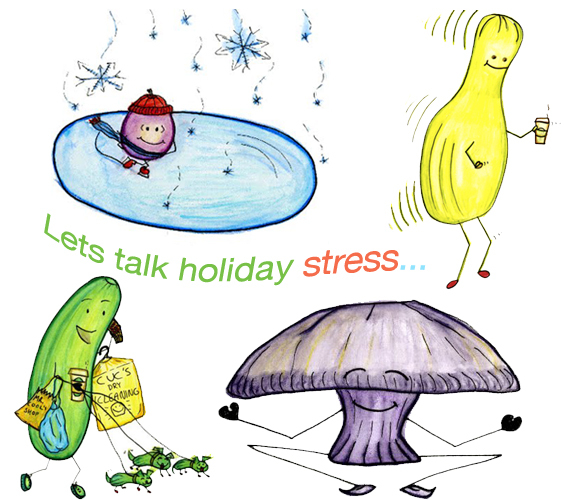 Ahead, you'll find my 10 Tips to Manage Holiday (and everyday) Stress! Plus I have an awesome $75 SpaFinder.com + C3* for Stress giveaway for you! Breath in ....... breath out..... click ahead. Stress touches us all - and there is really no way to remove the stresses in our lives - unless you are planning on moving to a private island, chucking your cellphone to the sea and saying adios to society. Well, actually, I'm sure there are everyday stresses in paradise too. A cloud blocking your sunbeam could be quick upsetting I'm sure. We are all in the thick season of stress: the holidays, So rather than attempt to ditch stress, lets simply try to manage it. Here are ten of my favorite ways to feel a little more chill. 1. Deep Breathing. Each breath you take has a startling impact on how you feel. And each breath also reflects on how you are feeling. Here is a breathing exercise to try to help you manage a stressful situation or just stay in a zen mood. Close your eyes and find your zen within each deep breath you take. 3. Water Power. I'm a huge fan of bubble baths. And adding little goodies to bring your bath up to par. Try essential oils, sea salts, Epsom salts and even some bubble-bath-approved kitchen pantry items like day-old wine, sugar for scrubbing your skin and baking soda. And for total rejuvenation, try some hot/cold water therapy. 4. Ginger Juice. To calm a troubled tummy (tummy troubles often have roots in everyday stresses) - try juice that is boosted by some fresh ginger. You may have to seek out a juice bar if you don't have a juicer. I have several ginger-infused juice recipes in my drink index. Try my AM Sunrise Juice. 5. Travel Zen. Try my pre-travel routine to ease travel stress. 7. Probiotics! Again, tummy troubles are no fun. And stress can set them off. So be sure to take a probiotic around the holidays and load up on probiotic foods like soy yogurt, kombucha and fermented foods like sauerkraut, pickles, tempeh and more. 8. Try Chamomile. Blend up a Calm Chamomile Smoothie or brew some chamomile tea. 9. Grab a Banana. Keeping your blood sugar levels up during the holidays is a must. So I always keep bananas on hand and even in my purse when I am out and about. Heck, Starbucks and 711 even sell fresh bananas! Bananas are a perfect calming food because they contain Vitamin B6, potassium, fiber, are easy to digest and have actually been shown to interact with the lining of your stomach to produce digestive-enhancing mucous, helping to protect your stomach against acid. Potassium, an important electrolyte for a hydrated, happy (and calm) body. Try my Banana Almond Shake for instant energy. 10. 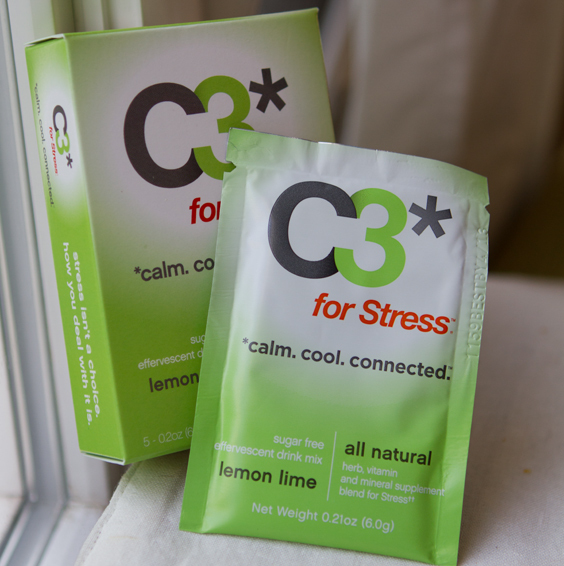 Try C3* for Stress - and enter my giveaway! I was pretty amazed that this stuff actually worked and gave me a fuzzed-out, chill feeling within minutes. Fizzy and lightly sweetened with a zesty flavor - C3 is easy to drink. Visit C3* for Stress for more info and enter my giveaway below!! C3* for Stress Review. I was skeptical. I'm not a big fan of supplements featuring big claims. And a powdery pack that claims to calm me down seemed pretty outrageous to me. But I swirled the mixture into a glass of chilled water and sipped. Within minutes I felt different. A main ingredient is kava root. C3*'s blend of kava and other botanicals like polygala root, longan berries and more definitely chilled me out. I personally would only use c3* in the PM hours because it was so strong for me. But if you want a buzz - a buzz of calm - try this stuff and see if it works for your stress management routine. I love that C3* is sugar free - sweetened with stevia - and contains 100% RDA of vitamins B6, B12, Zinc and Niacin. Note: always read packaging and warnings before trying - and I'm a huge fan of always discussing new supplements with your doctor before trying them. *GIVEAWAY ENTRY PERIOD HAS ENDED* Congrats to the winner: Heidi. How to Enter -> enter by commenting on this post. You must comment to gain initial entry into the giveaway. Comment by telling me what your go-to way to manage or reduce stress is. Maybe it is a food, activity or even a favorite calming quote. * tweet this post and include @replies as shown: " I just entered the @C3forStress Giveaway hosted by @Lunchboxbunch - enter here: http://bit.ly/sOzXfU "